One weekend we were relaxing and happened to watch an episode of The Barefoot Contessa where Ina made a huge batch of cranberry orange scones for her husband. Jeremy commented about what a lucky guy that man is, so of course I got right into the kitchen at the first opportunity to make him some scones of his very own. Never let anyone say that my husband is deprived in the arena of baked goods when he asks for them. I’ve now made these twice now, and they come out beautifully, tender inside and crisp outside. They better, with all of that fat from butter and cream! I freeze about half of them because they make such a large batch. I do part with cranberries, and part with mini-chocolate chips or cacao nibs, thanks to my personal sweet tooth and aversion to dried fruit in my baked goods. There are certainly other options to consider that would pair well with the orange flavor, and even more if you substitute the orange with lemon or something else. Today I used a blood orange for the zest and glaze, and made some with cranberries and some with dessicated coconut and cacao nibs. The blood orange juice made a striking dark pink glaze for the scones, and they tasted great. Preheat the oven to 400F. In the bowl of a food processor, mix 4 C flour, 1/4 C sugar, the baking powder, salt and orange zest. Add the cold butter and pulse until the butter is the size of peas. Combine the eggs and heavy cream and slowly pour it into the flour and butter mixture, pulsing until just blended. The dough will look lumpy! Combine the dried cranberries and 1/4 C flour. Dump the dough onto a well-floured surface and knead the cranberries into it. Flour your hands and a rolling pin and roll (or press) the dough 3/4-inch thick. You should see small bits of butter in the dough. Keep moving the dough so it doesn’t stick. Use a 3-inch round cutter to cut rounds out of the dough. 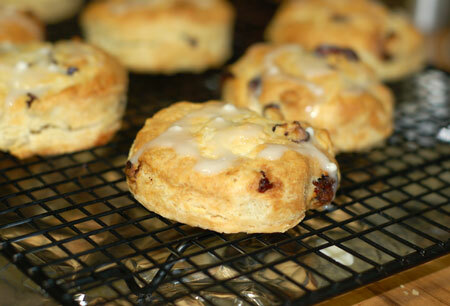 Place the scones on a baking pan lined with parchment paper. Collect the scraps neatly, roll them out, and cut more circles. Brush the tops of the scones with egg wash, sprinkle with sugar, and bake for 20 to 25 minutes, until the tops are browned and the insides are fully baked. The scones will be firm to the touch. Allow to cool for 15 minutes and then whisk together the confectioners’ sugar and orange juice, and drizzle over the scones. This makes a lot of scones, but they freeze beautifully. Just cut the dough into rounds and freeze them raw, layered with waxed paper. They can be baked from the frozen state, just add a few minutes extra. Source: Adapted from Barefoot Contessa, with Ina Garten. Update 9/3/08: I added a photo to this post after baking off some frozen scones I found in the back of the freezer. If memory serves me correctly, I added desiccated coconut to the dough, and did some with cacao nibs and some with the cranberries. Even though these were a little freezer burned, I just brushed off the ice and you would never know it once they were baked. About 25-27 minutes did the trick.